Yes, you read that right. Waterfalls...near Tucson, Arizona. Although many of the mountain cascades are seasonal, flowing best in the early Spring or late Summer from the melting snow or monsoon rains, they can put on quite a show if you go at the right time. High up the Esperero Trail in the front range of the Santa Catalina Mountains, Bridal Veil Falls is much smaller than its more famous Yosemite cousin of the same name, but it's still a refreshing place to rest on a long hike. The drop is only about 10 feet high and it's at its best in Spring when melting snow feeds its flow. You'll pass by Bridal Veil Falls on your hike to the Cathedral, or you could build your own hike that ends at the falls itself. The draw to Hutch's Pool is mostly the pool, and for good reason, but there is also a nice perennial waterfall at the North end that feeds into it. There is a small rocky ledge just above it with a tree growing out of the rock which makes for a fantastic spot to grab a snack in the shade and listen to the rushing water. You can get to the pool by following the Hutch's Pool hike. 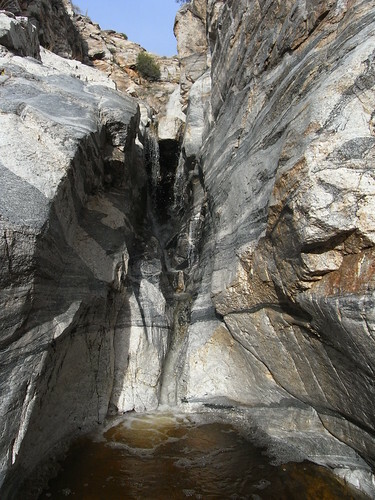 Near the old Prison Camp part way up the Catalina Highway, there is a seasonal waterfall that has cut itself a smooth route through the bedrock of the mountain canyon. You will need to build your own short hike to get there, but you can also look down on it from the top of Soldier Hill at the end of the Soldier Trail hike. BONUS: If you do Soldier Trail hike, you will pass by a place called the Kitchen, where the same stream that feeds Soldier Falls can be seen pouring over a much taller ledge into a deep canyon below. Okay so, yes, this is a man-made waterfall, but its pretty impressive nevertheless. The reservoir behind it has long since silted in, creating a beautiful riparian area, and the concrete foundation from the old pump house provides a great spot to rest and enjoy the view. As usual, early Spring and late Summer provide the most volume of water. Sycamore Reservoir is the official hike that will take you there. More well known for the pools that are above it, Maiden Falls is an astonishing sight for those who venture down to see it. There is an extremely treacherous route down the cliff to the East of the falls, but it is possible to downclimb to the bottom of the 30 foot waterfall which has cut a small pool into the rock below. You'll find this waterfall on both the Maiden Pools hike, as well as the Window. A little downstream from Bridal Wreath, which is further down on this list, Ernie's Falls is a spectacular seasonal waterfall right in the middle of the high desert grasslands in the foothills of the Rincon Mountains East of town. You will need to build your own hike to get there, and you'll have a bit of a scramble if you want to reach the base of the falls itself because the trail only passes it by rather than taking you right to it. Like Maiden Pools, the watery playground in Romero Canyon is much better known for the nearly perennial pools than the waterfalls, but that shouldn't take away from the cascades that are there. The best display is found just a short distance up the canyon from the popular pools, right in the middle of a small loop in the trail that forks and rejoins on either side of it. Do the Romero Pools hike to get there. BONUS: About two thirds of the way to Romero Pools, there is a great little vista surrounded by large boulders that looks down into Romero Canyon to the North. As you peer down into it, you can usually spot another respectable waterfall at the bottom. A short distance from the spot where Novio Spring bubbles out of the mountainside, the stream it creates falls down three tiers solid rock. While there is almost always a trickle, the best time to visit is in early Spring when the snow melt adds to the deluge. The Butterfly Loop hike will get you there, but you'll need to keep an eye out for the little spur trails that can take you to either the top or the bottom of the falls itself. In between the Catalinas and Agua Caliente Hill Northeast of Tucson, seasonal rains get funneled into La Milagrosa Canyon where four consecutive pools are fed by just as many waterfalls. The most direct hike there is head up the canyon on the Level 1 Milagrosa Pools hike, but you can also build your own hike off of the Milagrosa Loop hike to reach the falls from above. BONUS: If you do the Milagrosa Loop hike, there is another waterfall fed pool just about halfway through the hike. The second man made waterfall on our list, Sabino Dam was built to create a recreational reservoir with the perennially flowing Sabino Creek. The lake filled with silt long ago and now the pools below the dam have become a popular place to relax and enjoy the cascade down the rocky barrier. The Level 1 loop hike, Sabino Canyon Dam, is the ideal way to experience the dam for the first time. A "cataract" isn't just an eye problem, it's also another word for a waterfall. Since "Seven Falls" was already taken (keep reading to find it on this list), these seven consecutive cascades had to be named something else. Most people only ever scope out the cataracts from the vista point on the Catalina Highway that looks down on them, but it's difficult to appreciate their scale from that distance. The route down to Seven Cataracts is very slippery and far too treacherous to justify an official Level 1 hike, so you'll need to build your own to get there. Right in the middle of the Wilderness of Rocks, there is a beautiful little spot tucked down in a canyon where three waterfalls pour into a large pool surrounded by a huge flat rock, some deciduous trees, and a little shady sandbar. Lemmon Pools is an ideal place to relax by the sound of a spring fed waterfall. There is no official trail to get to Lemmon Pools, so you'll need to be very familiar with the area and build your own hike to reach it. 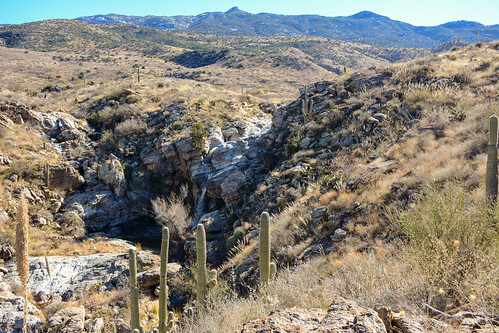 Out past the very East end of Speedway Boulevard, the Douglas Spring trail will take you up into the foothills of the Rincon Mountains where you'll find an impressive seasonal waterfall. A rocky overhang creates a drop of more than 20 feet that you can actually sit under, behind the falls. This waterfall is the destination of the Level 3 Bridal Wreath hike, but you can also build your own to add the nearby Ernie's Falls (#11 on this list) or just make Bridal Wreath a stopover on your way up to Douglas Springs Campsite. If there is one feature on this list that is not a surprise, it is probably this one. Seven Falls is the destination for one of the most popular hikes around Tucson, and with good reason. These seven waterfalls flow almost year round and they create an idyllic oasis in the middle of a rocky desert canyon. The Seven Falls hike will show you how to get there. More commonly visited by people on wheels than on foot, Chive Falls in the middle of Redington Pass is a spectacular site if you can catch it at the right time of year. Water falls over a rocky overhang that allows you to climb behind the torrent as it crashes on a large rock at the bottom, filling a sizable pool. 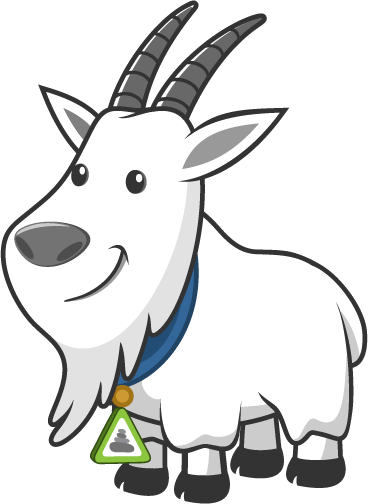 You'll probably run into several 4x4s and mountain bikers out there, but you can reach Chiva Falls with this Level 5 hike. Before we get to #1, we wanted to point out a few other waterfalls that didn't make the list, but can still be spectacular if you catch them at the right time. The first is Lime Falls, out in Saguaro National Park East, which can be reached on either the Lime Kiln or Cactus Forest hikes. Second is the waterfall that is visible down at the bottom of Esperero Canyon to the West of Cardiac Hill. Although you may be able to bushwhack your way to that one, it's plenty enjoyable to admire it from above. Finally, on the Palisades Level 5 hike, if you go in the early Spring, you'll get to a point near the vista at the end where you can turn and look back over your left shoulder to catch a view of Pine Creek's stellar seasonal waterfall. 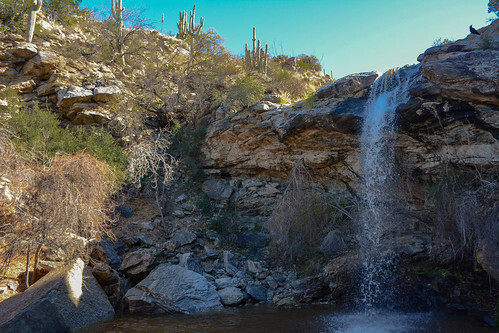 Tanque Verde Falls has everything you could want in a waterfall: a short hike to get there, pools of water to play in, multiple nearby falls, and a stunning main attraction, all in a gorgeous setting. There is almost always some water flowing here, but the early Spring and late Summer are the best times to see the full display. WARNING: Although this waterfall is beautiful and therefore popular, it is also extremely dangerous. 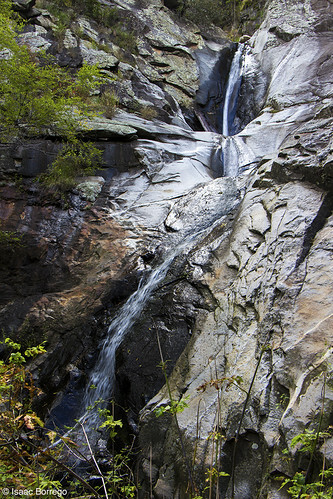 It is not uncommon for people to be injured or killed here from cliff jumping or getting swept away in a flash flood. We advise against jumping and recommend avoiding the falls if rain is in the forecast anywhere in the area, even miles away. There is a Level one hike that will take you right to the falls, but if the waters are raging, you can still catch a great view by building your own hike to the nearby overlook at the top of the North wall of the canyon. Do you agree with our rankings? Did we leave a waterfall off that should have been included? Tell us in the comments.